The Fitch ratings agency today issued a warning that growing debt at Magnitogorsk Metallurgical Combine (MMK), owned by Victor Rashnikov, is at a “higher level than previously expected”. With prices for MMK’s products falling, the company’s free cashflow is under pressure, the Fitch report claims, as it downgraded its outlook forecast for MMK from stable to negative. The agency said also that it has made no changes to MMK’s long-term and short-term issuer default ratings, which are BB+ and B, respectively. It may issue a downgrade of those, the agency adds, if the negative cashflow persists. 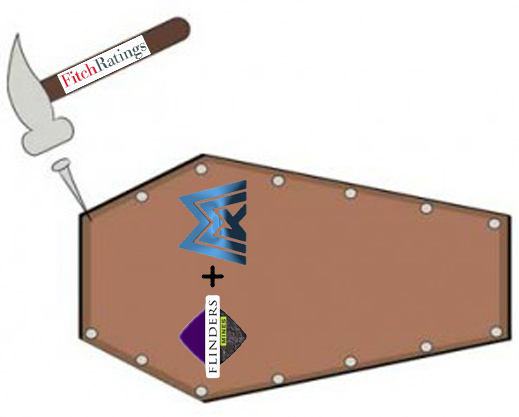 MMK’s version of the Fitch warning attempts a cosmetic makeover. That is as convincing to investors as French silicone is to breasts. In the public release by Fitch today, there is no reference to MMK’s attempted takeover of Australian iron-ore project, Flinders Mines, for A$558 million, with capital expenditure required to follow of at least A$1.3 billion. That story, and of the proceedings in the Chelyabinsk Arbitrazh Court to block the deal, can be read here. Confirmation that the court case represents an exit from the deal for Rashnikov came privately from one of Rashnikov’s steelmaking peers in recent comments to fund managers in London. The Chelyabinsk court has scheduled a hearing of the case next week, on May 24, and may decide to lift the injunction or make it permanent. Before that can happen, however, the federal government ministers officially empowered to decide whether Rashnikov will complete or cancel the Australian acquisition will have to be confirmed by President Vladimir Putin, and he is delaying his agreement for the time being. Internal argument over the new positions and powers of officials previously in charge of the steel sector, like Deputy Prime Minister Igor Sechin and Deputy Prime Minister Igor Shuvalov, is one reason for this delay. Lobbying on MMK’s behalf by Dmitry Afanasiev has been delayed for the same reason. Delay in decision-making at the Kremlin level is likely to be detected by, if not telephoned to the Chelyabinsk judge presiding, Natalia Bulavinseva, and a further postponement may be ordered. If that pushes past the June 30 deadline agreed between MMK and Flinders Mines, the Australians may opt to salvage their share price losses by opening new sale negotiations with Mitsubishi or a Chinese buyer. In its last financial report, issued on April 16, MMK revealed that sales revenues for the group had fallen 8% in the fourth quarter of last year to $2.24 billion, while the operating profit line moved into the red with a loss of $47 million. Earnings (Ebitda) for the group in the quarter came to $203 million, down 42% from the third quarter. Of this earnings aggregate, $227 million was recorded for the Russian operations, down 14% on the previous quarter. The Turkish operations were loss-making, MMK admits, with negative Ebitda of $67 million compared to a positive $28 million in the third quarter. The red-ink has also been reflected in spending cuts at MMK. For the first time, MMK has admitted publicly that it slashed capital investment in 2011 — a trend which has been an ignition point for the Russian debate over the advisability of the Flinders Mines acquisition. According to the MMK financial report, “total capital expenditure (capex) during 2011 was USD 1,154 million, 48% down y-o-y.” Most of this money went, MMK has said, to the completion of the Turkish mills at Iskenderun and Istanbul, and to Mill-2000 at the main mill site in Russia. MMK reports also that as of December 31, its long and short-term borrowings were $4.4 billion, up 26% on the year earlier. The Fitch report claims that domestic Russian steel demand is “likely to remain strong over the medium term. At the same time there is negative trend in prices for steel products in May 2011, which explains the decrease in margin for steel companies.” The report also notes that a cost-cutting effort is under way to reduce the price of iron-ore supplied to MMK by ENRC in Kazakhstan. Fitch’s prognosis may be too optimistic. Russian government statistics just out reveal the Russian economy sharply decelerated in March after an earlier rebound in February, confirming that the prospects for the steelmakers are likely to worsen this quarter. Industrial growth in March decelerated to a year-on-year rate of 2% from 6.5% the month before. Capital investment dropped to a rate of 4.9% year on year from 15.1% in February. Construction growth turned negative in March, compared to the year earlier. For Russian steelmaking, all this portends contraction of sales revenues in the second and third quarters, shrinking profit margins, and dwindling cashflow. Even Evraz, the far from transparent steel company owned by Roman Abramovich and Alexander Abramov, reported this week to the market that it is cutting output and capacity at its Russian mills. Blast Furnace 5 at the Nizhny Tagil mill was shut down for 17 days in April, and BF 3 at the West Siberian (Zapsib) mill will be halted for 12 days in June. The company claims the reason is “capital repairs”. Other capacity-cutting measures announced by Evraz include the “temporary shutdown” of one of two electric-arc furnaces at Zapsib, and a halt to production at the Nizhy Tagil railmill while new production capacity is installed. MMK’s latest trading report, dated April 26, confirms that in its first-quarter operations it suffered from declining prices. The average price per tonne for domestic sales came to $772 per tonne, a decline of 1.4% on the last quarter, and down 7% compared to the same period of 2011. Export sales fetched an average of $517/t, down 7.3% on the quarter, down 14% on the year. On the other hand, here’s the good news. Overall, crude steel output reached 3.42 million tonnes, up 9.9% quarter on quarter, while rolled steel volume came to 3.02 million tonnes, up 5.7% over the same interval. At MMK’s main mill site at Magnitogorsk, finished steel volume rose 5.5% to 2.77 million tonnes. Mill-5000, which produces thick plate for Russia’s pipemills, recovered to 248,000 tonnes, , up 45% on the last quarter. The company also reports price growth for thick plate of 5.7% over the quarter– a sign that demand for large-diameter pipe (LDP) may be recovering in the oil and gas industry as it drills more wells and lays more pipelines to port. Still – and this remains a bone of contention with the Kremlin — investment by MMK will be reduced this year, Fitch forecasts. If the negative cashflow persists, and MMK cannot reduce both costs and debts, Fitch warns this will “put pressure on the ratings.” That line is missing from the MMK version of the ratings report.